A counter-thrust by the Sri Lanka Army’s (SLA) elite 53 division to recapture areas in Jaffna lost to the Liberation Tigers in the past two days was destroyed by LTTE forces using artillery and close quarter fighting, sources in Kilinochchi said. In Colombo, ambulances have been shuttling between Ratmalana and hospitals in the capital since early hours Sunday carrying military wounded, sources said. LTTE fighters were consolidating in areas captured from the Sri Lankan military over the past two days whilst continuing operations against other SLA positions, sources in Kilinochchi said. 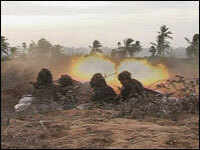 The SLA’s 53 Division launched a major counter-thrust Sunday to dislodge LTTE forces, but the attack was crushed by LTTE artillery and ground forces, the sources said. An SLA tank was fully destroyed, another severely damaged. Military sources in Colombo said at least 250 Sri Lankan soldiers had been killed or wounded in the past two days of intense fighting. The government officially says 27 killed and 70 wounded. Since 2:30 a.m. local time, ambulances with sirens have been shuttling between Ratmalana and Colombo hospitals carrying SLA wounded, sources in the capital said, counting 16 Ambulance trips throughout the day. Two of the 16 ambulances rushed to the Army hospital, the others going to Colombo general hospital, the sources said. The brigades of the 53 Division are also trained by the US Special Forces, which have been closely involved with its development and training since 1997. The 53 division consists of the Airmobile Brigade, a Mechanised Infantry Brigade and a Special Forces Brigade. Other reports from Jaffna said that an SLA headquarters at Varani had come under intense LTTE bombardment Saturday night compelling the occupants to temporarily abandon their positions inside the base and seek safety elsewhere. Reports from Jaffna said that the airbridge to Palaly remained disrupted as LTTE shells were intermittently hitting the airbase. At the same time, sea-based supply lines to the northern peninsula had been disrupted by Sea Tigers activity and shelling of the Trincomalee naval base, sources in the eastern port town said Sunday. SLA wounded are being ferried off the peninsula in helicopters before being airlifted to Colombo hospitals, sources said.